Not to be confused with Modern Standard Hindi. The Central Zone languages are a group of related language varieties spoken across northern and central India. These language varieties form the central part of the Indo-Aryan language family, itself a part of the Indo-European language family. They historically form a dialect continuum that descends from the Madhya Prakrits. Located in the Hindi Belt, the Hindi language varieties also includes the Khariboli dialect, the primary dialect spoken in Delhi and the basis of modern Hindi and Urdu. This dialect developed over centuries into the medieval Hindustani language, of which Modern Standard Hindi and Modern Standard Urdu are today derived from. Both Hindi and Urdu are standardizations of the Hindustani language that was historically spoken in Delhi and used as a lingua franca across Northern India. In regards to the Indo-Aryan language family, the coherence of this language group depends on the classification being used; here only Eastern and Western Hindi will be considered. If there can be considered a consensus within the dialectology of Hindi proper, it is that it can be split into two sets of dialects: Western and Eastern Hindi. Western Hindi evolved from the Apabhramsa form of Shauraseni Prakrit, Eastern Hindi from Ardhamagadhi. Western Hindi languages. Clockwise from the top: Hindustani, Kannauji, Bundeli, Braj, Haryanvi. The Eastern Hindi languages are not shown individually. 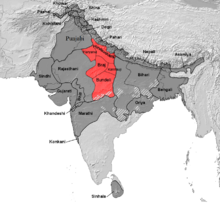 They are Awadhi in the north, east of Hindustani and Kannauji; Bagheli in the center, to the east of Bundeli, and Chhattisgarhi to the southeast of Bundeli. Braj Bhasha (21 m), spoken in western Uttar Pradesh and adjacent districts of Rajasthan and Haryana. Haryanvi (8 m), spoken in Chandigarh, Haryana, and as a minority in Punjab and Delhi. Bundeli (3 m), spoken in south-western Uttar Pradesh and west-central Madhya Pradesh. Kannauji (9.5 m), spoken in west-central Uttar Pradesh. Hindustani (312 m), including the standard vernacular dialect Khariboli (and its standardised forms Standard Hindi and Urdu), spoken in western Uttar Pradesh and Delhi. Awadhi (38 m), spoken in north and north-central Uttar Pradesh as well as Fiji. Bagheli (8 m), spoken in north-central Madhya Pradesh and south-eastern Uttar Pradesh. Chhattisgarhi (13 m), spoken in southeast Madhya Pradesh and northern and central Chhattisgarh. This analysis excludes varieties sometimes claimed for Hindi for cultural reasons, such as Bihari, Rajasthani, and Pahari. Bhojpuri is classified under the Bihari languages though it has long been considered a Hindi language. Romani, Domari, Lomavren, and Seb Seliyer (or at least their ancestors) appear to be Central Zone languages that migrated to the Middle East and Europe ca. 500–1000 CE in three distinct waves. Parya is a Central Zone language of Central Asia. To Western Hindi Ethnologue adds Sansi, Powari, Chamari (a spurious language), Bhaya, Gowli (not a separate language), and Ghera. Urdu is the official language of Pakistan. Although only the native language of 7% of the population, it is nearly universal as a second language among the literate. Bombay Hindi ("Bombay Baat"), the dialect of the city of Mumbai (Bombay); it is based on Hindustani but heavily influenced by Marathi. Technically it is a pidgin, i.e. neither is it a native language of any people nor is it used in formal settings by the educated and upper social strata. However, it is often used in the movies of Hindi cinema (Bollywood) because Mumbai is the base of the Bollywood film industry. Dakhini, including Hyderabadi Urdu, and Bangalori Urdu, a dialect of Urdu spoken in the present areas of the erstwhile Hyderabad State, and the historical Deccan region. There is a small but distinct difference between Dakhini and standard Hindi-Urdu, which is bigger the further south it is spoken. Andaman Creole Hindi is a trade language of the Andaman Islands. Fiji Hindi is an Eastern Hindi lingua-franca that developed among Indo-Fijians. Caribbean Hindustani and "Sarnami" are Eastern Hindi lingua-franca that developed among Indo-Caribbeans and are very similar to the Bhojpuri and Awadhi dialect of Hindi and to Fiji Hindi. Mauritian Hindi is spoken in Mauritius. It is based on Bhojpuri and influenced by French. South African Hindi, based on Bhojpuri, Awadhi, and Standard Hindi, is spoken by Indian South Africans. The standard educated Delhi Hindustani pronunciations [ɛː, ɔː] commonly have diphthongal realizations, ranging from [əɪ] to [ɑɪ] and from [əu] to [ɑu], respectively, in Eastern Hindi varieties and many non-standard Western varieties. There are also vowel clusters /əiː/ and /əuː/. ^ Hammarström, Harald; Forkel, Robert; Haspelmath, Martin, eds. (2017). "Western Hindi". Glottolog 3.0. Jena, Germany: Max Planck Institute for the Science of Human History. ^ Hammarström, Harald; Forkel, Robert; Haspelmath, Martin, eds. (2017). "Eastern Hindi". Glottolog 3.0. Jena, Germany: Max Planck Institute for the Science of Human History. ^ Grierson, George A. (1916). "Western Hindi" (PDF). Linguistic Survey of India. Volume IX: Indo-Aryan family. Central group, Part 1, Specimens of western Hindi and Pañjābī. Calcutta: Office of the Superintendent of Government Printing, India.